The Dashboard application is focused on creating components where you can visualize several applications at the same time. With the dashboard application, it is possible to create, for example, a screen to visualize several graphs, and also, with the addition of the Index Widget create comparisons, show sum of values, among other functionalities. On the home screen, you can also configure where the Widgets will be displayed, they can be easily dragged and mounted according to the user’s need. At the homepage you can see the Widgets and some options. Used to edit Widget settings. Used to Delete a Widget. Besides that when the mouse is over the Widget, we can see a button to change the size of it. This option allows any application that exists in the project to be added to a Widget. To create the link enter the Widget and the application, it is necessary only to click on the field “Connection”, then it will be shown a list with all the applications existing in the project. In the toolbar settings, it is possible to configure the buttons that will appear in the toolbar of the application that is configured in connection. The toolbar options will be displayed according to the application being connected, that is, according to the toolbar of each application. This option allows you to add to an Index Widget based on a database table. To create an Index Widget you need to make a few settings. In this option we can define a title for the Widget for a better visualization of what we want to display. In this option we can define an icon to be shown in the Widget. Left: The left side of the Widget will be shown. Centralized: Will be shown in the center of the Widget. Right: This will be shown to the right of the Widget. 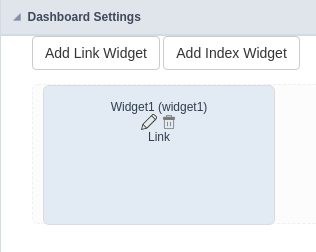 In this option it is allowed to choose which connection will be used in the Index Widget, each Widget can be configured with different connections. In this option it is allowed to choose which table will be used in the Index Widget. In this option it is allowed to select a table field to perform a metric, as in chart application. However it is possible to make some comparisons according to the period defined in the next option. In this option it is allowed to select a field from the table so that the data chosen in the previous option can be compared. In this option you can configure the formatting of the metric and period that will be shown in the execution of the filter. Internal: The index metric will be shown as a value of integer type. Decimal: The index metric will be shown as a value of type Decimal. Moeda: The metric of the index will be shown as a value of type Modal. Lets you define whether the metric will follow the settings that were defined in the Regional Settings. Allows you to set how many decimal places will be in the metric index, however this will only be available when the metric format is Decimal or Currency. Allows you to set whether the value will be completed with zeros when set to Decimal or Currency. Lets you set whether the number in the index will appear in a scale or the whole number. If Yes is chosen, the number instead of 10.000 will appear with 10 k value. Allows you to set whether the period will follow the settings that were set in the regional settings. Lets you to set whether to display the name of the month. Prefix for semester, four-month, quarter, two-month, week. Lets you inform a [lang][lang_sc] or a title that the developer wants to appear. Lets you set whether to show the name of the day. Allows you to perform the filter configuration that will be displayed when the Index Widget is running. In this option we can define the condition of the filter so that the information regarding that metric is shown, and it is not possible to change that at run time. In this option we can define the condition of the filter so that the information regarding that period is shown, and it is not possible to change at run time. We must define which periods are available for use in the filter. Another option referring only to the relative period is the possibility of creating conditions with relative periods customized directly within the filter interface. Year: Sets the year used in the filter. Quarter: Defines the quarters used in the filter. Month: Sets the usage of the months of the year. Week: Sets the use of the weeks of the year. Day: Sets the use of the days of the month. Allows you to create filters from table fields. In this option you can configure the layout of the map that will appear in the Widget. It allows you to set a background color for the widget content. Enables or disables the running widget header. Enables or disables the button to delete the widget at run time. Enables or disables the option that allows widgets to be moved at runtime. Enables or disables the option to maximize the widget. Enables or disables the button to expand the widget. Allows you to define in seconds a time for the Widget to be reloaded, thus reloading the information.